We're finally back in California after a ten days of traveling around the US on business...and seeing snow everywhere. 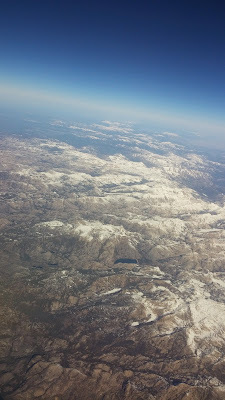 And then we flew back over the Sierra on our way home. 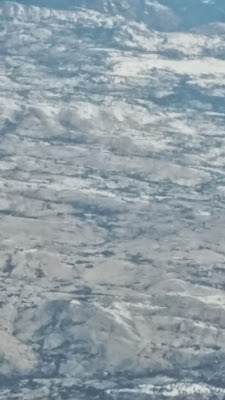 As we flew right over the northern part of Yosemite, we could see that there was very little snow below 10,000 feet in the park...and no snow at all in the western part of Emigrant Wilderness. This is so sad. But don't take our word for it. Listen to the experts: "Nearly a third of our SnoTel sites in the Cascades and Sierra Nevada are reporting the lowest snowpack ever measured," says NRCS Hydrologist Cara McCarthy. "For the first time, some sites were snow-free on March 1. These areas can expect reduced summer streamflow." What does this mean for backpacking this summer? It's hard to say. A big set of storms in April could change this a lot, but right now we're guessing that the whole darn summer will be changed. Streams will be lower in June, and may dry up by late August or September. Roads and trailheads may open early. And many plants and animals have to adapt in a big way, or die.